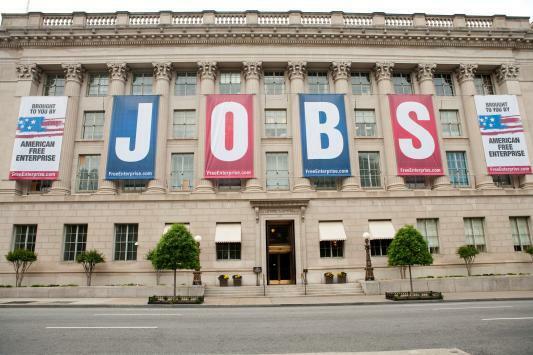 US Chamber of Commerce's major contribution to jobs creation dialog: A giant banner taunting the White House across Pennsylvania Avenue. Three years have passed since the financial crisis of 2008, and unemployment rates remain painfully high. As of August 2011, America employed 6.6 million fewer workers than it did four years earlier. To try to fix the problem, the Obama administration has pursued a variety of Keynesian measures—above all, the huge stimulus package of 2009, which included not only direct government spending but also such features as tax credits for home buyers and temporary tax cuts for most Americans. Such policies ignore a simple but vital truth: job growth comes from entrepreneurs—and public spending projects are as likely to crowd out entrepreneurship as to encourage it. By putting a bit more cash in consumers’ pockets, the tax cuts in the stimulus package may have induced a bit more car- and home-buying, but the next Steve Jobs is not being held back by too little domestic consumer spending. Tax credits for home buyers and the infamous program Cash for Clunkers encourage spending on old industries, not the development of the new products that are likelier to bring America jobs and prosperity. Unemployment represents a crisis of imagination, a failure to figure out how to make potential workers productive in the modern economy. The people who make creative leaps to solve that problem are entrepreneurs. If we want to bring America’s jobs back, our governments—federal, state, and local—need to tear down barriers to entrepreneurship, create a fertile field for start-up businesses, and unleash the risk-taking innovators who have always been at the heart of our economic growth.